NEW: Sharing and Remixing directly from MIT App Inventor’s Integrated Gallery! The App Inventor team is happy to announce a new feature designed to encourage sharing and exploration of projects and the code behind them. App Inventor now has an integrated gallery for sharing your apps and exploring the code of others’ apps! From within App Inventor, you can easily publish your projects to the gallery and with one click open any app to remix it. Sharing your apps and "source blocks" has never been easier. If you ever wondered “How did they build that”, now you’ll be able to explore and figure it out. Try it out and take part in this new collaborative environment! 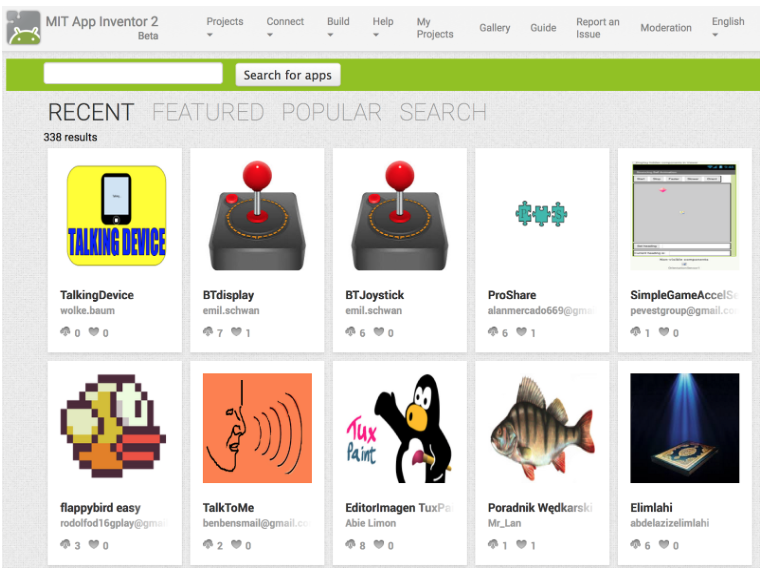 Click on the "Gallery" item on the top toolbar at ai2.appinventor.mit.edu to browse and search the existing apps. To publish, go to your “My Projects” page, select one of your projects, then click Publish! You can even receive daily email notifications telling you how many times your app has been downloaded and liked, and get a share link that will take people directly to your app. David Wolber’s Democratizing Computing Lab at the University of San Francisco led the development of the integrated gallery, with the support of the MIT team. Special thanks go to Bin Lu and Vincent Zhang, the USF students who were the main developers, and as always to MIT’s Jeff Schiller who reviewed, edited, and performed his usual magic for the project. We also thank the W.M. Keck Foundation for their generous support of this and other App Inventor related projects.